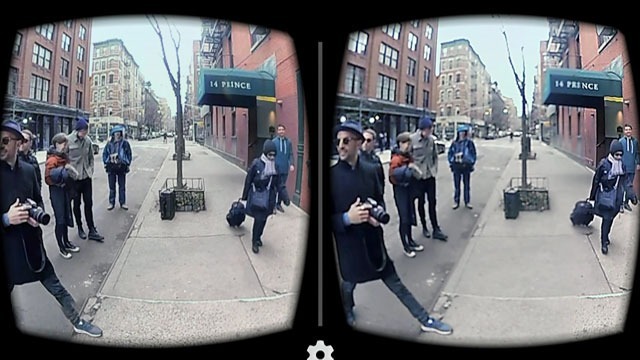 The timing may have been coincidental, but the fact that both old media stalwart The New York Times and new tech giant YouTube today both voiced their commitment to virtual reality signals that the new form of storytelling is entering the mainstream. The story went on to explain that If you have an iPhone, you can find the NYT VR app in the App Store and that for Androids, you can download the app from Google Play. Or you can buy a Cardboard viewer here. This weekend, subscribers to the Sunday NYT print edition will receive Cardboard VR viewers in the mail. “This new filmmaking technology enables an uncanny feeling of connection with people whose lives are far from our own,” writes Jake Silverstein, editor of the magazine. Certainly, immersive documentaries help to create a feeling of empathy given that viewers literally feel as if they’re right there. In its own announcement on the company blog, YouTube also explains what virtual reality is, what viewers could gain from it and how to watch it. “Virtual reality (VR) makes the experience of being there even more awesome and immersive, so today we’re bringing two new VR features to YouTube’s Android app. All you need is your current phone, and a Google Cardboard viewer,” according to the YouTube blog. The company created a VR video playlist so audiences can experience it for themselves (if they can figure out how). Given that YouTube is owned by Google, which produces Google Cardboard, they’ve got an incentive to push VR content. YouTube also announced that users can now watch any video using Google Cardboard, and “experience a kind of virtual movie theater.” If users select the new “Cardboard” option from the watch page menu and their phone into the viewer, they can watch in VR. “You’ll now have the largest VR content library right at your fingertips,” promises YouTube. Meanwhile, virtual reality storytelling is already catching on in the indie film world though it’s unclear if Virtual Reality could change filmmaking. Certainly, VR is gaining momentum. Yesterday Sundance announced that it has partnered with virtual reality company Jaunt Studios to create the Sundance Institute New Frontier, a new residency program which will focus on telling cinematic, narrative stories in a virtual reality setting. On the TV side, Netflix and Hulu separately announced plans to launch new virtual reality apps. But are audiences clamoring to watch virtual reality content? Clearly, all of these media companies believe there’s a demand. Only time will tell if they’re right.